Corporate Cryptocurrencies: a growing trend? In this article we will look at corporate cryptocurrencies. Currently, there is a growing interest of big companies in cryptocurrencies and blockchain. With adoption of cryptocurrencies and Bitcoin in particular growing day by day, people have begun to speculate whether household names like Facebook, eBay and Amazon are poised to enter the crypto market and create their own currencies or maybe start accepting existing ones as a payment method on their platforms. Companies endeavoring to release their own tokens to the broader public have taken to selling them in an “initial coin offering,” similar in some ways to an IPO. They then use the funds raised through the sale to formally launch or increase their activity. Corporate cryptocurrencies could have a bright future ahead. Big companies are beginning to show interest in cryptocurrencies and blockchain. Just recently, Amazon and Starbucks expressed interest in integrating blockchain and cryptocurrency in their payment systems. As leading companies in e-commerce and coffee, these two retailers operate worldwide and have millions of customers. If they decide to incorporate cryptocurrency and blockchain in their corporate models, there is a high chance that most of their customers will start appreciating and using virtual currencies. They will also have more confidence in the cryptocurrency and blockchain sectors because corporate companies are putting them to use. Corporate Cryptocurrencies: the future of doing business? So do corporate cryptocurrencies have the potential to become mainstream? The interest Amazon and Starbucks have in virtual currencies affirms the fact that cryptocurrency and blockchain are the future of doing business. The day these companies announced their plans to integrate cryptocurrency and blockchain, they closed business on a high note – an indicator the news were received positively by the market. These industries are rapidly becoming mainstream and no company is ready to remain behind. The decision by Amazon and Starbucks to incorporate cryptocurrency and blockchain is likely to have been driven by the steadily rising adoption of these technologies. Therefore adopting blockchain technology and creating their own digital currencies is a good decision for the two companies. Blockchain is a decentralized network or platform that is used to facilitate and manage cryptocurrency transactions. The platform has gained popularity because it enables faster, efficient, safe and cost effective transactions using digital assets. Facebook is also working on creating its own cryptocurrency, something the social network began researching about a year ago, sources told Cheddar. Until recently, corporate development team member Morgan Beller was the sole employee exploring how Facebook could use cryptocurrency. Facebook announced that David Marcus, the VP in charge of Messenger, would head up a new team of about a dozen employees that will explore how Facebook can “best leverage” blockchain. While that news wasn’t specifically tied to cryptocurrency development, Cheddar’s report suggests such development will be part of its mission. Marcus is the former president of PayPal, an early Bitcoin investor and member of the board for cryptocurrency exchange Coinbase. Facebook’s cryptocurrency plans could take several years to develop. The company isn’t planning to hold an initial coin offering, where the public can purchase a limited number of the cryptocurrency, sources told Cheddar. The company could acquire existing blockchain and cryptocurrency companies. Will Amazon launch its own cryptocurrency? As to whether Amazon will foray into the corporate cryptocurrency arena and launch its own cryptocurrency remains to be seen. Investors and digital currency analysts are speculating that the e-commerce titan may be making inroads. People are wondering what will be the move of Amazon with buying domains. Is Amazon gearing up for a Cryptocurrency Exchange? ValueWalk.com reporter Maj Soueidan suggests Amazon could be “gearing up for cryptocurrency exchanges” following reports the company has registered names related to cryptocurrencies. The domans include: amazonethereum.com, amazoncryptocurrency.com, amazoncryptocurrencies.com. Regardless of what Amazon’s plans are for its new domains, the suggestion that the company is receptive to getting involved in the digital currency space may be enough to inspire investors to place their assets there. The support of a corporate juggernaut like Amazon could take the cryptocurrency space from a hot trend to a long-term fixture of the investment and business worlds. “Amazon opts to include new products or services only when these are useful for customers – until that point, we do not engage in rough speculation”. Will eBay accept virtual currencies? Will Starbucks create a token to use in its stores? Starbucks could be set to launch a corporate cryptocurrency. Some cryptocurrency supporters were speculating about the possibility of Starbucks to create a token to use in its stores. Something similar to what Burger King did in some countries with it’s Whoppercoins built on the Waves platform. Starbucks does not currently accept cryptocurrency. However, according to the Executive Chairman, Howard Shultz, Starbucks is working on the implementation of a payment application based entirely on blockchain technology. Does this mean that Starbucks is planning to launch a cryptocurrency? Mr Shultz said that the firm is working in an application that will be integrated with blockchain and will help to reduce waiting times and improve customer’s attention. ‘Blockchain technology is poised to take a very important place in our environment and to transform, if not revolutionize, the current economic ecosystem, especially in the areas of the video game industry and online transactions. Given our technological strengths with the development studios, and the global reputation of the Atari brand, we have the opportunity to position ourselves attractively in this sector. Our objective is to take strategic positions with a limited cash risk, in order to optimize the assets and the Atari brand’. Kodak will also be launching the KodakOne platform, which will use blockchain technology to give photographers an encrypted ledger to be able to register rights for their work to be able to license it more easily. Kodak chief executive Jeff Clarke touted the benefits of the new technology: “For many in the tech industry, ‘blockchain’ and ‘cryptocurrency’ are hot buzzwords, but for photographers who’ve long struggled to assert control over their work and how it’s used, these buzzwords are the keys to solving what felt like an unsolvable problem,” said Clarke. In Canada, KFC’ ‘Bitcoin Bucket,’ can only be purchased with Bitcoin. $20 worth of digital currency gets you 10 original piece tenders, waffle fries, a medium side, gravy, and two dips. Payments for the bucket go through Bitpay and carry a $5 shipping fee. “Sure, we don’t know exactly what bitcoins are, or how they work, but that shouldn’t come between you and some finger lickin’ good chicken,” the company wrote on Twitter at the time of the launch. “Welcome to 2018, Canada,” the page read. “Despite the ups and downs of bitcoin, the Colonel’s Original Recipe is as good as always. 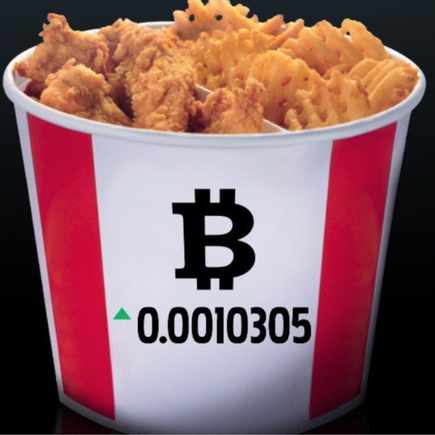 So, trade your bitcoins for buckets and invest in something finger lickin’ good. Finally, we turn to Garrett Camp, best known for being a co-founder of Uber who is launching his own cryptocurrency. The currency is called Eco, and Camp wants it to be a digital global currency that can be used as a payment tool around the world for daily-use transactions. So, will corporate cryptocurrencies take off? Well, should these giant companies actualize their plans, there is no doubt this will have a huge impact on the cryptocurrency industry. The introduction of corporate cryptocurrencies may see rising crypto prices, an upsurge in the market value of cryptocurrencies, an increase in crypto-investments, increased confidence in the crypto market and speedy formulation of market regulations. Corporate cryptocurrencies could be set change the financial landscape and become part of our everyday lives.